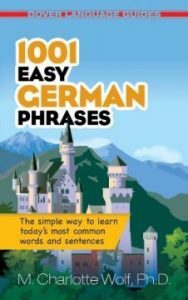 The perfect companion for tourists and business travelers in Germany and other places where the German language is spoken, this book offers fast, effective communication. More than 1,000 basic words, phrases, and sentences cover everything from asking directions and renting a car to ordering dinner and finding a bank. Designed as a quick reference tool and an easy study guide, this inexpensive and easy-to-use book offers completely up-to-date terms for modern telecommunications, idioms, and slang. The contents are arranged for speedy access to phrases related to greetings, transportation, shopping, services, medical and emergency situations, and other essential items. A handy phonetic pronunciation guide accompanies each phrase.